The 1958 US–UK Mutual Defense Agreement, or UK–US Mutual Defence Agreement, is a bilateral treaty between the United States and the United Kingdom on nuclear weapons cooperation. The treaty's full name is Agreement between the Government of the United States of America and the Government of the United Kingdom of Great Britain and Northern Ireland for Cooperation on the uses of Atomic Energy for Mutual Defense Purposes. It allows the United States and the UK to exchange nuclear materials, technology and information. While the US has nuclear cooperation agreements with other countries, including France and some NATO countries, this agreement is by far the most comprehensive. Because of the agreement's strategic value to Britain, Harold Macmillan (the Prime Minister who presided over the United Kingdom's entry into the agreement) called it "the Great Prize". The treaty was signed on 3 July 1958, after the Soviet Union shocked the American public with the Sputnik crisis on 4 October 1957, and the British hydrogen bomb programme successfully tested a hydrogen bomb in the Operation Grapple test on 8 November 1957. The Anglo-American Special Relationship proved mutually beneficial, although it was never one of equals; the United States was far larger than Britain both militarily and economically. Britain soon became dependent on the United States for its nuclear weapons, as it lacked the resources to produce a range of designs. The treaty allowed American nuclear weapons to be supplied to Britain through Project E, for the use by the Royal Air Force and British Army of the Rhine. The treaty provided for the sale to the UK of one complete nuclear submarine propulsion plant, plus ten years' supply of enriched uranium to fuel it. Other nuclear material was also acquired from the United States under the treaty. Some 5.4 tonnes of UK produced plutonium was sent to the US in return for 6.7 kilograms (15 lb) of tritium and 7.5 tonnes of highly enriched uranium between 1960 and 1979, although much of the highly enriched uranium was used not for weapons, but as fuel for the growing fleet of UK nuclear submarines. The treaty paved the way for the Polaris Sales Agreement, and the Royal Navy ultimately acquired entire weapons systems, with the UK Polaris programme and Trident nuclear programme using American missiles with British nuclear warheads. The treaty has been amended and renewed nine times. The most recent renewal extended it to 31 December 2024. Quebec Conference in 1943. 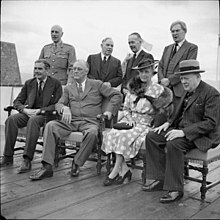 Seated are Anthony Eden, President Franklin D. Roosevelt, the Countess of Athlone and Winston Churchill. Standing are the Earl of Athlone (Governor General of Canada); Mackenzie King (Prime Minister of Canada); Sir Alexander Cadogan, and Brendan Bracken. During the early part of the Second World War, Britain had a nuclear weapons project, codenamed Tube Alloys. At the Quadrant Conference in August 1943, the Prime Minister of the United Kingdom, Winston Churchill and the President of the United States, Franklin Roosevelt, signed the Quebec Agreement, which merged Tube Alloys with the American Manhattan Project to create a combined British, American and Canadian project. The Quebec Agreement established the Combined Policy Committee and the Combined Development Trust to coordinate their efforts. Many of Britain's top scientists participated in the British contribution to the Manhattan Project. The September 1944 Hyde Park Aide-Mémoire extended both commercial and military cooperation into the post-war period, but Roosevelt died on 12 April 1945, and it was not binding on subsequent administrations. In fact, it was physically lost. When Field Marshal Sir Henry Maitland Wilson raised the matter in a Combined Policy Committee meeting in June 1945, the American copy could not be found. The Quebec Agreement specified that nuclear weapons would not be used against another country without mutual consent. On 4 July 1945, Wilson gave British agreement for the use of nuclear weapons against Japan. On 8 August 1945 the Prime Minister, Clement Attlee, sent a message to President Harry Truman in which he referred to themselves as "heads of the Governments which have control of this great force". The British government had trusted that the United States would continue to share nuclear technology, which it considered to be a joint discovery. On 9 November 1945, Attlee and the Prime Minister of Canada, Mackenzie King, went to Washington, D.C., to confer with Truman about future cooperation in nuclear weapons and nuclear power. A Memorandum of Intention they signed on 16 November 1945 made Canada a full partner, and replaced the Quebec Agreement's requirement for "mutual consent" before using nuclear weapons with one for "prior consultation". There was to be "full and effective cooperation in the field of atomic energy", but British hopes were soon disappointed; this was only "in the field of basic scientific research". The United States Atomic Energy Act of 1946 (McMahon Act) ended technical cooperation. Its control of "restricted data" prevented the United States' allies from receiving any information on pain of death. This partly resulted from the arrest for espionage of British physicist Alan Nunn May in February 1946, while the legislation was being debated. Fearing a resurgence of American isolationism, and Britain losing its great power status, the British government restarted its own development effort, now codenamed High Explosive Research. By the end of 1947, 1,900 long tons (1,900 t) of uranium ore was stockpiled for the Combined Development Trust at Springfields, near Preston in Lancashire, because the McMahon Act did not permit it to be exported from the United States, along with 1,350 long tons (1,370 t) for British use. To gain access to this stockpile for their own nuclear weapons project, the Americans opened negotiations that resulted in the Modus Vivendi, an agreement which was signed on 7 January 1948. This officially terminated all previous agreements, including the Quebec Agreement. It removed the British right of consultation on the use of nuclear weapons, allowed for limited sharing of technical information between the United States, Britain and Canada, and continued the Combined Policy Committee and the Combined Development Trust, although the latter was renamed the Combined Development Agency. In 1949, the Americans offered to make atomic bombs in the United States available for Britain to use if the British agreed to curtail their atomic bomb programme. This would have given Britain nuclear weapons much sooner than its own target date of late 1952. Only those bomb components required by war plans would be stored in the UK, the rest would be kept in the US and Canada. The offer was rejected by the British on the grounds that it was not "compatible with our status as a first class power to depend on others for weapons of this supreme importance." As a counter-offer, they proposed limiting the British program in return for American bombs. The opposition of key American officials, including Lewis Strauss from the United States Atomic Energy Commission (AEC), and Senators Bourke B. Hickenlooper and Arthur Vandenberg of the Joint Committee on Atomic Energy (JCAE), coupled with security concerns aroused by the 2 February 1950 arrest of the British physicist Klaus Fuchs, as an atomic spy, caused the proposal to be dropped. The June 1951 defection of Donald Maclean, who had served as a British member of the Combined Policy Committee from January 1947 to August 1948, reinforced the Americans' distrust of British security arrangements. The first British atomic bomb was successfully tested in Operation Hurricane on 3 October 1952, but although it was more advanced than the American bombs of 1946, Britain was still several years behind in nuclear weapons technology. The United States conducted Ivy Mike, the first nuclear test of a true thermonuclear device (also known as a hydrogen bomb). The JCAE saw little benefit for the United States from sharing technology with Britain. The Soviet Union responded with the test of Joe 4, a boosted fission weapon on 12 August 1953. This prompted President Dwight Eisenhower, who was inaugurated in January 1953, to inform the United States Congress that the McMahon Act, which he considered a "terrible piece of legislation" and "one of the most deplorable incidents in American history of which he personally felt ashamed", was obsolete. 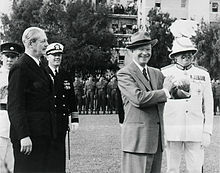 At the three-power Bermuda Conference in December 1953, Eisenhower and Churchill discussed the possibility of the United States giving Britain access to American nuclear weapons in wartime. This came to be called Project E. There were technical and legal issues that had to be overcome before American bombs could be carried in British aircraft. The United States would have to disclose their weights and dimensions, while their delivery would require data concerning their ballistics. Further down the track, there would also be issues of custody, security and targeting. The release of such information was restricted by the McMahon Act. This was amended on 30 August 1954 by the Atomic Energy Act of 1954, which allowed for greater exchange of information with foreign nations, paving the way for the Agreement for Cooperation Regarding Atomic Information for Mutual Defence Purposes, which was signed on 15 June 1955. On 13 June 1956, another agreement was concluded, for the transfer of nuclear submarine propulsion to Britain, saving the British government millions of pounds in research and development costs. This precipitated a row with the JCAE over whether it was permitted under the Atomic Energy Act of 1954, and whether Britain met the security standards set by the 1955 agreement. With the 1956 presidential election approaching, Eisenhower was forced to back down. The October 1956 Suez crisis brought relations between Britain and the United States to a low ebb. When Eisenhower met with the new Prime Minister, Harold Macmillan, in Bermuda in March 1957, he raised the possibility of basing US intermediate range ballistic missile (IRBM) systems in the UK. This came to be called Project Emily. There were also discussions on exchanging nuclear submarine propulsion technology for information on the British Calder Hall nuclear power plant, allowing the United Kingdom Atomic Energy Authority to purchase uranium ore from Canada, and coordinating the war plans of RAF Bomber Command with those of the Strategic Air Command. Although the IRBM negotiations pre-dated the Suez crisis, it suited the British government to tout the IRBM deal as a demonstration that the rift had been healed. Britain tested its first hydrogen bomb in the Operation Grapple test at Christmas Island on 15 May 1957. The Grapple tests were facilitated by the United States, which also claimed the island. Although the initial tests were unsuccessful, the Grapple X test on 8 November 1957 achieved the desired result. 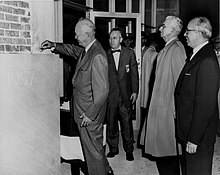 Eisenhower (left) lays the cornerstone for the new Atomic Energy Commission (AEC) building in Germantown, Maryland, on 8 November 1957. Joint Committee on Atomic Energy (JCAE) Chairman Carl T. Durham (centre) and AEC Chairman Lewis Strauss (right) look on. British timing was good. The Soviet Union's launch of Sputnik 1, the world's first artificial satellite, on 4 October 1957, came as a tremendous shock to the American public, who had trusted that American technological superiority ensured their invulnerability. Now, suddenly, there was incontrovertible proof that, in some areas at least, the Soviet Union was actually ahead. In the widespread calls for action in response to the Sputnik crisis, officials in the United States and Britain seized an opportunity to mend the relationship with Britain that had been damaged by the Suez Crisis. At the suggestion of Harold Caccia, the British Ambassador to the United States, Macmillan wrote to Eisenhower on 10 October urging that the two countries pool their resources, as Macmillan put it, "to meet the Soviet challenge on every front, military, political, economic and ideological." Macmillan flew to Washington, DC, for talks on 25 October, despite concerns that the 10 October Windscale fire might prove a stumbling block in negotiations. He immediately sensed how shaken the Americans had been by Sputnik. It placed the Eisenhower administration under great public pressure to act on the deployment of IRBMs by a shocked and distraught nation. Eisenhower and Macmillan agreed to form a study group headed by Sir Richard Powell, the Permanent Secretary to Ministry of Defence, and Donald A. Quarles, the United States Deputy Secretary of Defense, to consider how the deployment of IRBMs to Britain might be expedited. Another study group, under Strauss and Sir Edwin Plowden, the head of the United Kingdom Atomic Energy Authority (UKAEA), would investigate nuclear cooperation and the exchange of nuclear information. The personal relationship developed between Plowden and Strauss would be crucial in converting the latter over to the idea of providing information to Britain. By December 1957, most of the issues with the IRBM negotiations had been ironed out, and a formal agreement was drawn up on 17 December 1957, although it was not until the end of the month that it was definitely determined that Britain would receive Thor and not Jupiter missiles. However, the nuclear submarine propulsion effort was running into trouble. Under the July 1956 agreement and a February 1957 directive from Eisenhower, Royal Navy officers had been assigned to study the US Navy's nuclear submarine program. By October 1957, its head, Rear Admiral Hyman G. Rickover, felt that their questions were slowing the deployment of the Polaris submarine-launched IRBM at a critical time. He feared that any delay might cause Congress to favour land-based missiles. By December, the British liaison officers were complaining of slow response to their questions. Rickover proposed that Westinghouse be permitted to sell the Royal Navy a nuclear submarine reactor, which would allow it to immediately proceed with building its own nuclear-powered submarine. The British government endorsed this idea, as it would save it a great deal of money. For their part, the British wanted the McMahon Act's restrictions on nuclear cooperation to be relaxed. They wanted to know the weight and dimensions, fusing and firing sequences, safety features, and in-flight procedures; the information that would allow American bombs to be carried in British V-bombers, and American warheads to be fitted to British Blue Streak missiles. This would potentially save millions of pounds and avoid domestic political complications if Britain had to persist with nuclear testing during an international moratorium. While the British knew what they wanted, there was no consensus among the Americans as to what they wanted to provide. The United States Secretary of State, John Foster Dulles, was concerned that a special relationship with Britain might complicate the United States' relationships with its other allies. Strauss in particular felt that a proposal to give hydrogen bomb secrets to the British would likely not get past the JCAE, and counselled drafting amendments that were sufficiently vague as to give the president the authority he needed without arousing its ire. Eisenhower declared that the US and UK were "interdependent", and pledged to ask Congress to amend the McMahon Act. Crucially, he managed to secure the support of Carl T. Durham, the chairman of the JCAE. Eisenhower met with Congressional leaders on 3 December 1957, and pressed for more discretion to cooperate with all America's NATO allies, and not just Britain. Indeed the administration negotiated agreements with Australia, Canada and NATO. While Eisenhower did not yet have wholehearted support for the proposal, outright opposition from Senator Clinton P. Anderson failed to attract much support. On 27 January 1958, Strauss sent Durham the administration's proposed legislative changes, and the JCAE Subcommittee on Agreements for Cooperation, chaired by Senator John O. Pastore, held hearings from 29 to 31 January. Quarles and Major General Herbert Loper, the Assistant to the Secretary of Defense for Atomic Energy Affairs, were forced to deal with pointed questions about nuclear proliferation. British information security, or the lack thereof, no longer seemed so important now that the Soviet Union was apparently ahead, and the United Kingdom had independently developed the hydrogen bomb, but the JCAE objected to the terms of the proposed deal to trade British uranium-235 for American plutonium, under which the US would pay the UK $30 per gram for plutonium that cost $12 per gram to produce. The amendments were passed by the House of Representatives on 19 June, but not without changes. It now limited exchanges of nuclear weapons data to nations that had made substantial progress in the field. The same restriction applied to the actual transfer of non-nuclear components of nuclear weapons. American nuclear weapons were to remain under US custody and could only be turned over to allies in the event of war. The sale of nuclear reactors for submarines and nuclear fuel for them and other military reactors was permitted. Only Britain qualified as a nation that had made substantial progress. The bill passed Congress on 30 June 1958, and was signed into law by Eisenhower on 2 July 1958. The 1958 US–UK Mutual Defence Agreement was signed by Dulles and Samuel Hood, the British Minister in Washington, on 3 July, and approved by Congress on 30 July. UK Defence Minister Des Browne (right) addresses a reception hosted by US Defense Secretary Robert M. Gates (left) commemorating the 50th anniversary of the US-UK Mutual Defense Agreement in Washington, DC, on 9 July 2008. The agreement enables the US and the UK to exchange classified information with the objective of improving each party's "atomic weapon design, development, and fabrication capability". While the US has nuclear cooperation agreements with other countries, including France and some NATO countries, none are similar in scope to the US-UK Mutual Defence Agreement. Macmillan called it "the Great Prize". Article 2 of the treaty covered joint development of defence plans; the mutual training of personnel in the use and defence against nuclear weapons; the sharing of intelligence and evaluation of enemy capabilities; the development of nuclear delivery systems; and the research, development and design of military reactors. The treaty called for the exchange of "classified information concerning atomic weapons when, after consultation with the other Party, the communicating Party determines that the communication of such information is necessary to improve the recipient's atomic weapon design, development and fabrication capability." The US would communicate information about atomic weapons that were similar to British atomic weapons. For the immediate future, that would exclude information about thermonuclear weapons. confidential intelligence matters are also covered by the agreement. The UK government has not published these sections "because of the necessity for great confidentiality and because ... it might well assist proliferation". Article 3 provided for the sale to the UK of one complete nuclear submarine propulsion plant, plus the uranium needed to fuel it over a ten year period. Due to concerns expressed by the JCAE, the AEC would determine the price that Britain would pay for highly enriched uranium (HEU). The treaty did not allow for non-nuclear components of nuclear weapons to be given to Britain. It was amended on 7 May 1959 to give Britain access to non-nuclear components, and to permit the transfer of special nuclear material such as plutonium, HEU and tritium. The treaty paved the way for the subsequent Polaris Sales Agreement, which was signed on 6 April 1963. The two agreements have been "the cornerstone of the UK-US nuclear relationship for nearly 60 years." in some respects we are as far, and even further, advanced in the art than our American friends. They thought interchange of information would be all give. They are keen that we should complete our series, especially the last megaton, the character of which is novel and of deep interest to them. An early benefit of the agreement was to allow the UK to "Anglicise" the US W28 nuclear warhead as the Red Snow warhead for the Blue Steel missile. The British designers were impressed by the W28, which was not only lighter than the British Green Grass warhead used in Yellow Sun, but remarkably more economical in its use of expensive fissile material. The Yellow Sun Mark 2 using Red Snow cost £500,000 compared with £1,200,000 for the Mark 1 with Green Grass. A 1974 CIA proliferation assessment noted that "In many cases [Britain's sensitive technology in nuclear and missile fields] is based on technology received from the US and could not legitimately be passed on without US permission." The UK National Audit Office noted that most of the UK Trident programme warhead development and production expenditure was incurred in the US who would supply "certain warhead-related components". There is evidence that the warhead design of the British Trident system is similar to, or even based upon, the US W76 warhead fitted in US Navy Trident missiles, with design and blast model data supplied to the UK. Britain soon became dependent on the United States for its nuclear weapons, as it lacked the resources to produce a range of designs. The treaty allowed the UK to receive US nuclear weapons for the RAF and British Army of the Rhine under Project E. Similar custody arrangements were made for the Thor missiles supplied under Project Emily. The UK was able to carry out underground nuclear tests at the US Nevada Test Site, where the first British test took place on 1 March 1962. British nuclear testing continued there until abruptly halted by President George H. W. Bush in October 1992. Major subscritical nuclear tests continued to occur, most notably the Etna test in February 2002, and the Krakatau test in February 2006. Under the agreement 5.37 tonnes of UK-produced plutonium was sent to the US in exchange for 6.7 kg of tritium and 7.5 tonnes of HEU between 1960 and 1979. A further 470 kg of plutonium was swapped between the US and the UK for reasons that remain classified. Some of the UK produced plutonium was used in 1962 by the US for the only known nuclear weapon test of reactor-grade plutonium. The plutonium sent to the US included some produced in UK civil Magnox reactors, and the US gave assurances that this civil plutonium was not used in the US nuclear weapons program. It was used in civil programmes which included californium production and reactor research. Some of the fissile materials for the UK Trident warhead were purchased from the US, but much of the HEU supplied by the US was used not for weapons, but as fuel for the growing fleet of UK nuclear submarines. Under the treaty, the US supplied the UK with not just nuclear submarine propulsion technology, but a complete S5W pressurised water reactor of the kind used to power the US Skipjack-class submarines. This was used in the Royal Navy's first nuclear-powered submarine, HMS Dreadnought, which was launched in 1960 and commissioned in 1963. The S5W had a Nuclear reactor core that used uranium enriched to between 93 and 97 per cent uranium-235. Reactor technology was transferred from Westinghouse to Rolls Royce, which used it as the basis for its PWR1 reactor used in the UK's Valiant, Resolution, Churchill, Swiftsure and Trafalgar submarines. The UK produced HEU at its facility in Capenhurst, but production for military purposes ceased there in March 1963. Thereafter, uranium oxide was imported from Australia, Canada, Namibia, South Africa, the United States and Zaire, and processed into uranium hexafluoride at Springfields. It was then shipped to the US, where it was enriched at the Portsmouth Gaseous Diffusion Plant in Piketon, Ohio. HEU was then flown back to the UK in RAF aircraft. In 1994, with the Portsmouth plant about to close, the treaty was amended, with the US requirement to provide uranium enrichment services changed to one to arrange them. 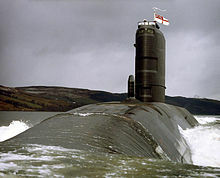 By March 2002, the UK had a stockpile of 21.86 tonnes of HEU, about 80 years' supply for the Royal Navy's nuclear-powered submarines. one-point safety, computer codes, metallurgy and fabrication technology for beryllium, uranium and plutonium, corrosion of uranium in the presence of water and water vapour, underground effects tests, outer-space testing, clandestine testing, the technology of lithium compounds, high explosives, deuterium monitors, extinguishing plutonium fires, high-speed cameras, mechanical safeing, liquid and solid explosive shock initiation, environmental sensing switches, neutron sources, tritium reservoirs, telemetry, hydrodynamic and shock relations for problems with spherical and cylindrical symmetry, cross sections, radiochemistry, atomic demolition munitions, warhead hardening, asymmetric detonations, terrorist nuclear threat response, nuclear weapons accidents and waste management. Warhead Electrical System – to develop architectures and technologies for warhead electrical systems. The balance of advantage in the exchanges was necessarily in Britain’s favour but they were not entirely one-sided. In some areas, notably electronics and high explosives, the British were equal or perhaps even superior, and in many areas they had valuable ideas to contribute, as the American scientists, and notably Teller, appreciated. A 1985 report by the State Department's Bureau of Intelligence and Research reported that the US was "profoundly involved and benefited greatly" from the treaty. The treaty was amended on 7 May 1959, 27 September 1968, 16 October 1969, 22 June 1974, 5 December 1979, 5 June 1984, 23 May 1994 and 14 June 2004. Most amendments merely extended the treaty for another five or ten years; others added definitions and made minor changes. As of 2018[update], the most recent renewal was on 22 July 2014, extending the treaty to 31 December 2024, with minor changes for the Trident nuclear programme. We are committed to the goal of a world without nuclear weapons and firmly believe that the best way to achieve this is through gradual disarmament negotiated through a step-by-step approach within the framework of the Nuclear Non-Proliferation Treaty. The UK has a strong record on nuclear disarmament and continues to be at the forefront of international efforts to control proliferation, and to make progress towards multilateral nuclear disarmament. The UK-USA Mutual Defence Agreement is, and will continue to be, in full compliance with our obligations under the Nuclear Non-Proliferation Treaty. ^ a b Macmillan 1971, p. 323. ^ Gowing 1964, pp. 108–111. ^ Hewlett & Anderson 1962, p. 277. ^ Hewlett & Anderson 1962, pp. 285–286. ^ Gowing 1964, pp. 236–242. ^ Gowing 1964, pp. 340–342. ^ Paul 2000, pp. 72–73. ^ Hewlett & Anderson 1962, pp. 457–458. ^ Gowing 1964, p. 372. ^ a b Goldberg 1964, p. 410. ^ Hewlett & Anderson 1962, pp. 372–373. ^ Gott 1963, p. 240. ^ Gowing & Arnold 1974a, pp. 73–77. ^ Gowing & Arnold 1974a, p. 92. ^ Paul 2000, pp. 80–83. ^ Hewlett & Anderson 1962, p. 468. ^ Gowing & Arnold 1974a, pp. 106–108. ^ Gowing & Arnold 1974a, pp. 105–108. ^ Gowing & Arnold 1974a, pp. 181–184. ^ Cathcart 1995, pp. 23–24, 48, 57. ^ Gowing & Arnold 1974a, pp. 358–360. ^ a b Botti 1987, pp. 34–35. ^ Gowing & Arnold 1974a, pp. 245–254. ^ Hewlett & Duncan 1969, pp. 281–283. ^ Gowing & Arnold 1974a, pp. 352–353. ^ Hewlett & Duncan 1969, p. 285. ^ Hewlett & Duncan 1969, pp. 307–308. ^ Hewlett & Duncan 1969, p. 310. ^ Gowing & Arnold 1974a, pp. 281–283. ^ Baylis 1995, p. 75. ^ Hewlett & Duncan 1969, p. 309. ^ Hewlett & Duncan 1969, pp. 312–314. ^ Botti 1987, pp. 74–75. ^ Gowing & Arnold 1974b, pp. 493–495. ^ Gowing & Arnold 1974b, pp. 474–475. ^ Arnold & Pyne 2001, pp. 16–20. ^ a b Arnold & Pyne 2001, pp. 27–30. ^ Gowing & Arnold 1974b, pp. 498–500. ^ a b Baylis 2008, pp. 429–430. ^ Paul 2000, pp. 200–201. ^ Young 2016, pp. 200–201. ^ Botti 1987, pp. 140–141. ^ Botti 1987, pp. 147–149. ^ Botti 1987, pp. 161–164. ^ Botti 1987, pp. 171–174. ^ Botti 1987, pp. 174–177. ^ Young 2016, pp. 98–99. ^ Botti 1987, pp. 180–181. ^ Young 2007, p. 8. ^ a b Baylis 1994, pp. 166–170. ^ Botti 1987, pp. 159–160. ^ Arnold & Pyne 2001, p. 147. ^ Arnold & Pyne 2001, pp. 160–162. ^ a b Botti 1987, pp. 199–201. ^ Arnold & Pyne 2001, p. 199. ^ "Foreign Relations of the United States, 1955–1957, Western Europe and Canada, Volume XXVII – Document 306". Office of the Historian, United States Department of State. Retrieved 12 September 2017. ^ a b Divine 1993, p. 34. ^ a b Baylis 2008, p. 438. ^ Divine 1993, pp. 73–74. ^ a b Baylis 2008, p. 440. ^ Baylis 2008, p. 442. ^ Wynn 1997, p. 287. ^ a b c d Botti 1987, p. 203. ^ Baylis 2008, pp. 441–442. ^ Baylis 2008, p. 439. ^ Moore 2010, p. 33. ^ a b Botti 1987, pp. 207–208. ^ a b Botti 1987, p. 214. ^ Botti 1987, pp. 215–219. ^ Botti 1987, pp. 224–225. ^ Botti 1987, p. 224. ^ Botti 1987, pp. 232–233. ^ Botti 1987, pp. 234–236. ^ a b c d e "Agreement between the Government of the United States of America and the Government of the United Kingdom of Great Britain and Northern Ireland for Cooperation on the uses of Atomic Energy for Mutual Defence Purposes" (PDF). Nuclear Threat Initiative. Retrieved 1 June 2017. ^ a b Botti 1987, p. 238. ^ Tobias Ellwood (The Parliamentary Under-Secretary of State for FCO) (24 November 2014). "Military Alliances:Written question – 214429". Hansard. UK Parliament. Retrieved 25 November 2014. ^ a b c Mills 2014, p. 3. ^ a b Botti 1987, pp. 236–237. ^ "UK-US Mutual Defence Agreement". Lords Hansard – column 1119. Hansard. 22 June 2004. Archived from the original on 12 March 2007. Retrieved 15 March 2007. ^ Moore 2010, pp. 84–85. ^ Baylis 2008, pp. 455–456. ^ Jones 2017, p. 444. ^ Arnold & Pyne 2001, pp. 202–205. ^ Macmillan 1971, p. 565. ^ Moore 2010, pp. 88–89. ^ Moore 2010, pp. 104–105. ^ "Prospects for Further Proliferation of Nuclear Weapons" (PDF). Special National Intelligence Estimate. CIA. 23 August 1974: 40. SNIE 4-1-74. Archived (PDF) from the original on 13 February 2008. Retrieved 20 January 2008. ^ Dan Plesch (March 2006). "The Future of Britain's WMD" (PDF). Foreign Policy Centre: 15. Archived from the original (PDF) on 21 June 2006. Retrieved 15 March 2007. ^ a b Ministry of Defence and Property Services Agency: Control and Management of the Trident Programme. National Audit Office. 29 June 1987. pp. ara. 1.1, 3.27, A4.4. ISBN 978-0-10-202788-4. ^ "Britain's Next Nuclear Era". Federation of American Scientists. 7 December 2006. Archived from the original on 6 February 2007. Retrieved 15 March 2007. ^ "Stockpile Stewardship Plan: Second Annual Update (FY 1999)" (PDF). United States Department of Energy. April 1998. Archived from the original (PDF) on 25 March 2009. Retrieved 15 March 2007. ^ a b Botti 1987, pp. 238–241. ^ Moore 2010, pp. 114–115. ^ Moore 2010, pp. 98–99. ^ "UK Mounts First Underground Nuclear Test (UGT)". Atomic Weapons Establishment. Archived from the original on 18 January 2008. Retrieved 15 March 2007. ^ Baylis 2008, p. 462. ^ Wade 2008, p. 209. ^ Wade 2008, p. 210. ^ a b "Plutonium and Aldermaston – an historical account" (PDF). UK Ministry of Defence. 4 September 2001. Archived from the original (PDF) on 13 December 2006. Retrieved 15 March 2007. ^ "Additional Information Concerning Underground Nuclear Weapon Test of Reactor-Grade Plutonium". US Department of Energy. June 1994. Retrieved 15 March 2007. ^ a b Ritchie 2015, p. 3. ^ Moore 2010, p. 35. ^ Ritchie 2015, p. 4. ^ Moore 2010, pp. 197–199. ^ Ritchie 2015, p. 7. ^ a b Moore 2010, p. 90. ^ Mills 2014, p. 5. ^ Philip Dunne (21 October 2014). "Written question 209762: Angus Robertson 26-09-2014". UK Parliament. Retrieved 27 October 2014. ^ Arnold & Pyne 2001, p. 215. ^ Baylis 2008, p. 461. ^ "Treaties in Force" (PDF). United States Department of State. Retrieved 8 September 2017. ^ "Disarmament Documentation: Amendment to the 1958 US-UK Mutual Defence Agreement (on nuclear weapons' cooperation), June 2004". Acronym Institute. Retrieved 12 September 2016. ^ "UK/US: Amendment to the Agreement for Cooperation on the Uses of Atomic Energy for Mutual Defense Purposes". Foreign & Commonwealth Office. 16 October 2014. Archived from the original on 22 March 2015. Retrieved 22 March 2015. ^ Norton-Taylor, Richard (30 July 2014). "UK-US sign secret new deal on nuclear weapons". The Guardian. Retrieved 8 September 2017. ^ Mills 2014, p. 10. Arnold, Lorna; Pyne, Katherine (2001). Britain and the H-bomb. Houndmills, Basingstoke, Hampshire ; New York: Palgrave. ISBN 978-0-230-59977-2. OCLC 753874620. Baylis, John (Summer 1994). The Development of Britain's Thermonuclear Capability 1954–61: Myth or Reality?. Contemporary Record. 8. pp. 159–164. ISSN 1361-9462. Baylis, John (1995). Ambiguity and Deterrence: British Nuclear Strategy 1945–1964. Oxford: Clarendon Press. ISBN 0-19-828012-2. Baylis, John (June 2008). "The 1958 Anglo-American Mutual Defence Agreement: The Search for Nuclear Interdependence". The Journal of Strategic Studies. 31 (3): 425–466. doi:10.1080/0140239002024726. ISSN 0140-2390. Botti, Timothy J. (1987). The Long Wait: the Forging of the Anglo-American Nuclear Alliance, 1945–58. Contributions in Military Studies. New York: Greenwood Press. ISBN 978-0-313-25902-9. OCLC 464084495. Cathcart, Brian (1995). Test of Greatness: Britain's Struggle for the Atom Bomb. London: John Murray. ISBN 0-7195-5225-7. OCLC 31241690. Divine, Robert A. (1993). The Sputnik Challenge. Oxford: Oxford University Press. ISBN 9780195050080. OCLC 875485384. Goldberg, Alfred (July 1964). "The Atomic Origins of the British Nuclear Deterrent". International Affairs. 40 (3): 409–429. doi:10.2307/2610825. JSTOR 2610825. Gott, Richard (April 1963). "The Evolution of the Independent British Deterrent". International Affairs. 39 (2): 238–252. doi:10.2307/2611300. ISSN 0020-5850. JSTOR 2611300. Gowing, Margaret (1964). Britain and Atomic Energy 1939–1945. London: Macmillan. OCLC 3195209. Gowing, Margaret; Arnold, Lorna (1974a). Independence and Deterrence: Britain and Atomic Energy, 1945–1952, Volume 1, Policy Making. London: Macmillan. ISBN 0-333-15781-8. OCLC 611555258. Gowing, Margaret; Arnold, Lorna (1974b). Independence and Deterrence: Britain and Atomic Energy, 1945–1952, Volume 2, Policy and Execution. London: Palgrave Macmillan. ISBN 0-333-16695-7. OCLC 946341039. Hewlett, Richard G.; Duncan, Francis (1969). Atomic Shield, 1947–1952 (PDF). A History of the United States Atomic Energy Commission. University Park, Pennsylvania: Pennsylvania State University Press. ISBN 0-520-07187-5. OCLC 3717478. Retrieved 7 March 2015. Jones, Matthew (2017). Volume I: From the V-Bomber Era to the Arrival of Polaris, 1945–1964. The Official History of the UK Strategic Nuclear Deterrent. Abingdon, Oxfordshire: Routledge. ISBN 978-1-138-67493-6. OCLC 957683181. Macmillan, Harold (1971). Riding the Storm: 1956–1959. London: Macmillan. ISBN 9780333103104. OCLC 198741. Mills, Claire (17 September 2014). "UK-US Mutual Defence Agreement" (PDF). House of Commons Library. Retrieved 12 September 2017. Moore, Richard (2010). Nuclear Illusion, Nuclear Reality: Britain, the United States, and Nuclear Weapons, 1958–64. Nuclear Weapons and International Security since 1945. Basingstoke, Hampshire: Palgrave Macmillan. ISBN 978-0-230-21775-1. OCLC 705646392. Paul, Septimus H. (2000). Nuclear Rivals: Anglo-American Atomic Relations, 1941–1952. Columbus, Ohio: Ohio State University Press. ISBN 978-0-8142-0852-6. OCLC 43615254. Ritchie, Nick (February 2015). "The UK Naval Nuclear Propulsion Programme and Highly Enriched Uranium" (PDF). Washington, DC: Federation of American Scientists. Retrieved 12 September 2017. Wade, Troy E. II (2008). "Nuclear Testing: A US Perspective". In Mackby, Jenifer; Cornish, Paul (eds.). US-UK Nuclear Cooperation After 50 Years. Washington, DC: Center for Strategic and International Studies Press. pp. 200–211. ISBN 978-0-89206-530-1. OCLC 845346116. Wynn, Humphrey (1997). RAF Strategic Nuclear Deterrent Forces, Their Origins, Roles and Deployment, 1946–1969. A documentary history. London: The Stationery Office. ISBN 0-11-772833-0. Young, Ken (Spring 2007). "A Most Special Relationship: The Origins of Anglo-American Nuclear Strike Planning". Journal of Cold War Studies. 9 (2): 5–31. doi:10.1162/jcws.2007.9.2.5. Young, Ken (2016). The American Bomb in Britain: US Air Forces' Strategic Presence 1946–64. Manchester: Manchester University Press. ISBN 978-0-7190-8675-5. OCLC 942707047.